6 of us stayed in Villa Ginger. 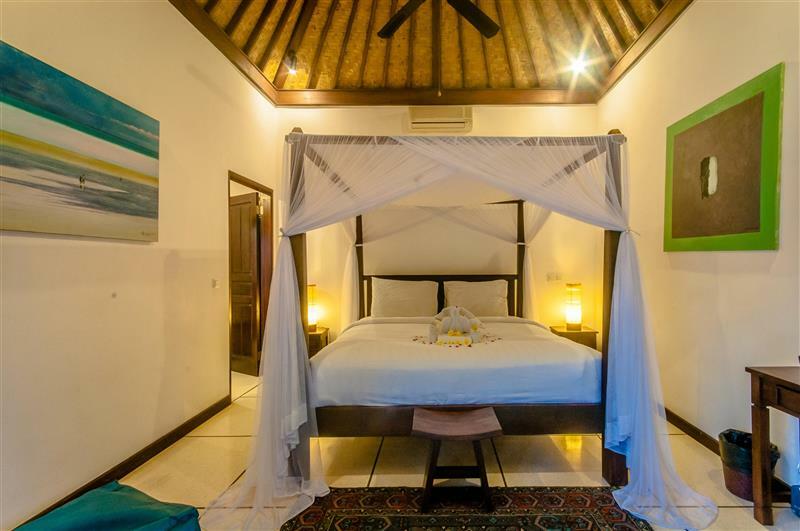 The villa was beautiful, perfect location in Seminyak and staff were very friendly and helpful. 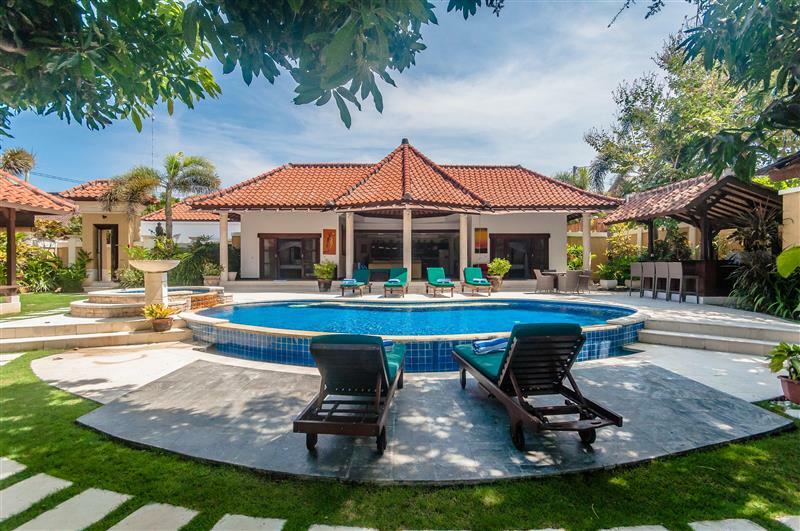 Villa was very clean and pool was great. 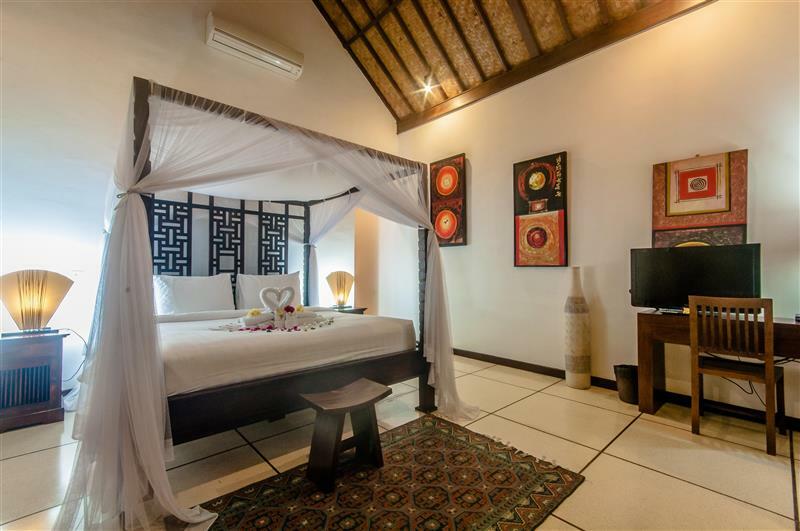 I highly recommend Villa Ginger and would stay here again on my return to bali. 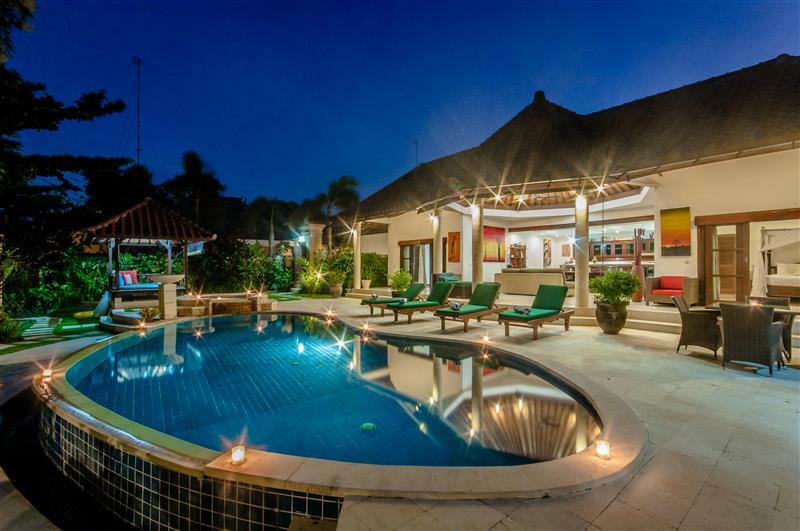 Villa ginger. Great place to stay location is fanatasic. Pancakes for breakfast lovely. Clean well Maintained, staff very friendly. 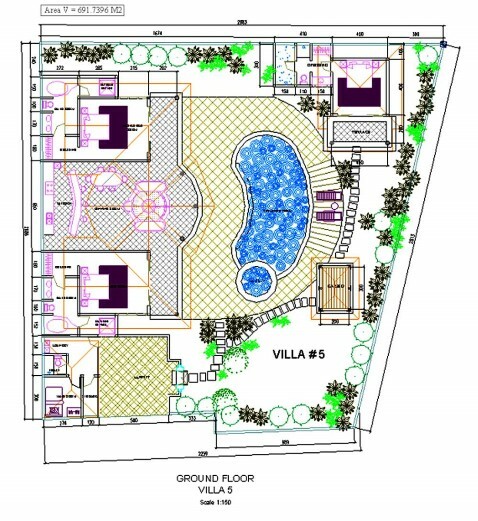 Villa Ginger. The Villa was great. The staff very helpful. Would stay again. 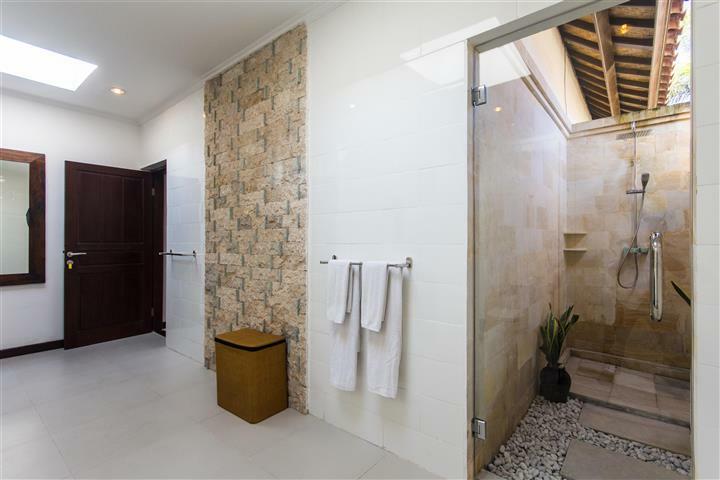 Villa Ginger, one of our private Bali villas, is perfectly positioned down a quiet gang, yet so close to the beach and all the shopping, eateries and bars you could wish for within easy walking distance. 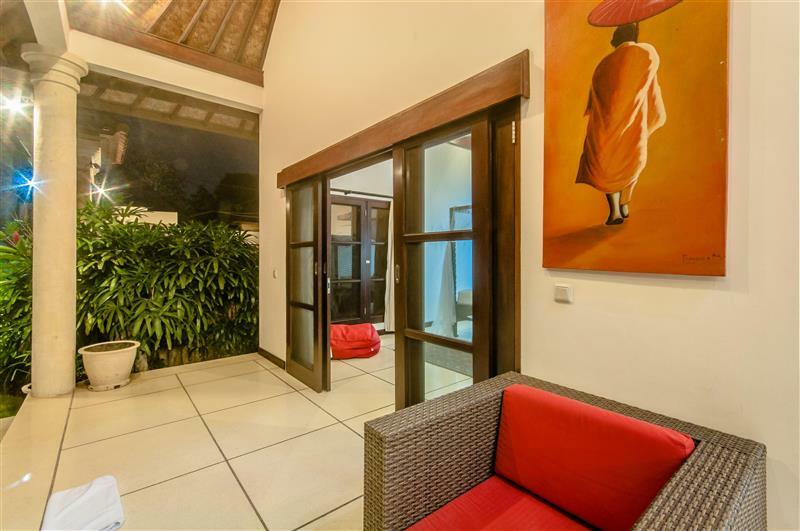 Entering the villa you become instantly aware of the space, and beautiful design of this villa. 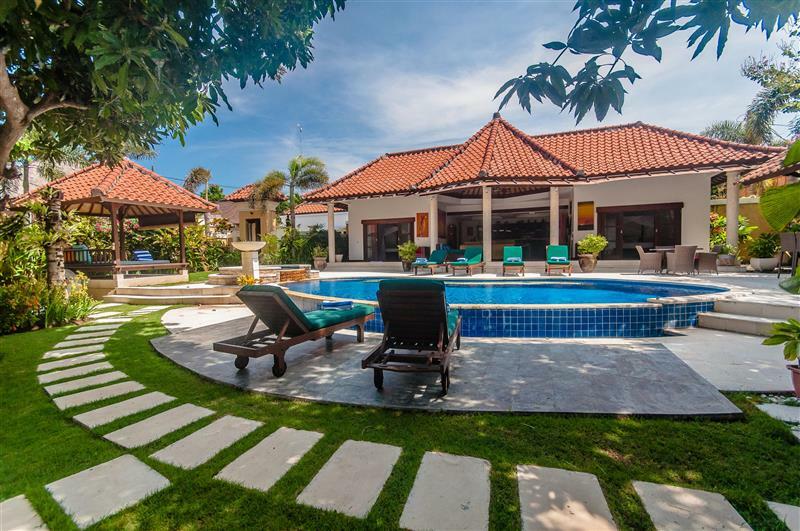 A large infinity pool with jacuzzi dominate the grounds, with a shady gazebo, split level tropical garden and expansive living areas mean that you will have little reason to ever leave the villa! 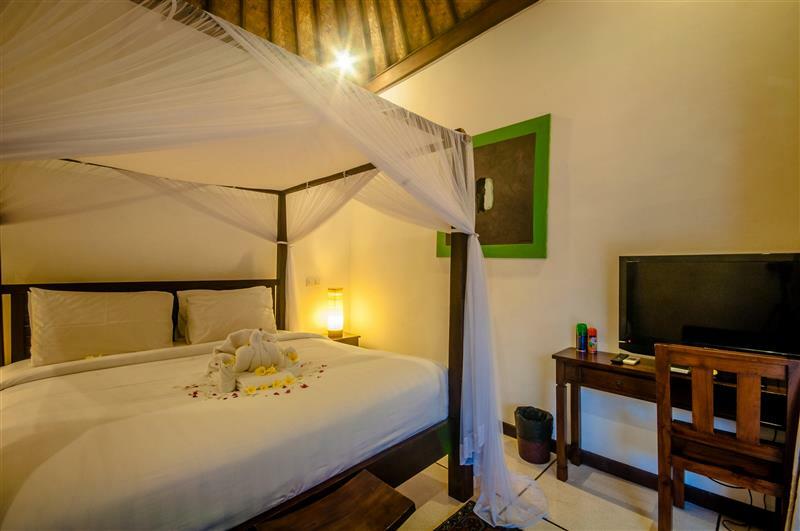 The main building is a beautifully decorated communal space with all the facilities you will need to enjoy a relaxing trip to Bali. 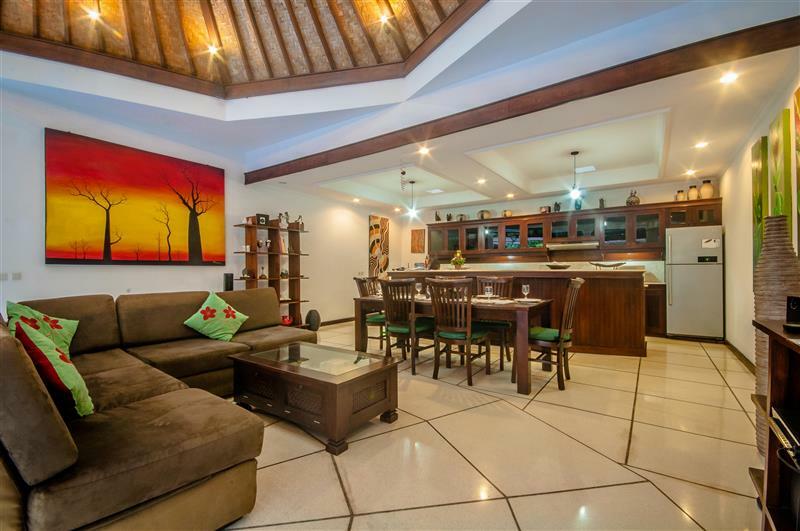 Lying across the back of this main space is a spacious kitchen, with rich dark wood fronts. 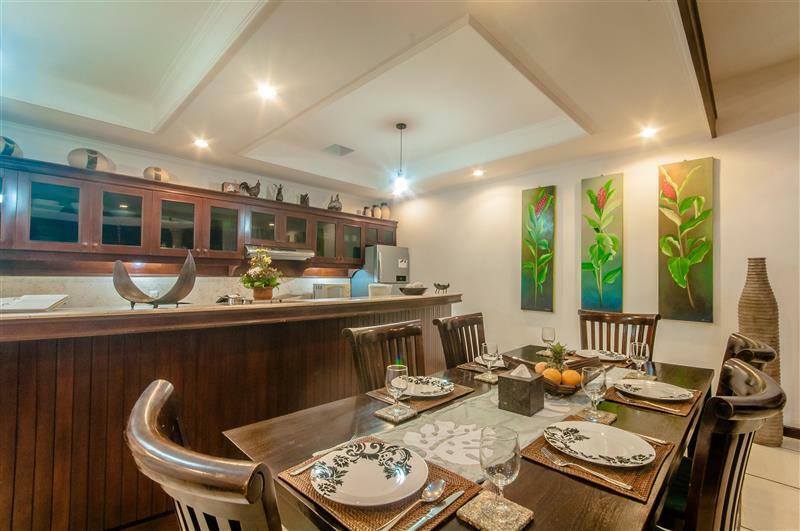 It is fully equipped with all appliances and utensils you may need to cook a group meal of an evening and enjoy dining together around the matching dark wood table which lies in front of the kitchen. 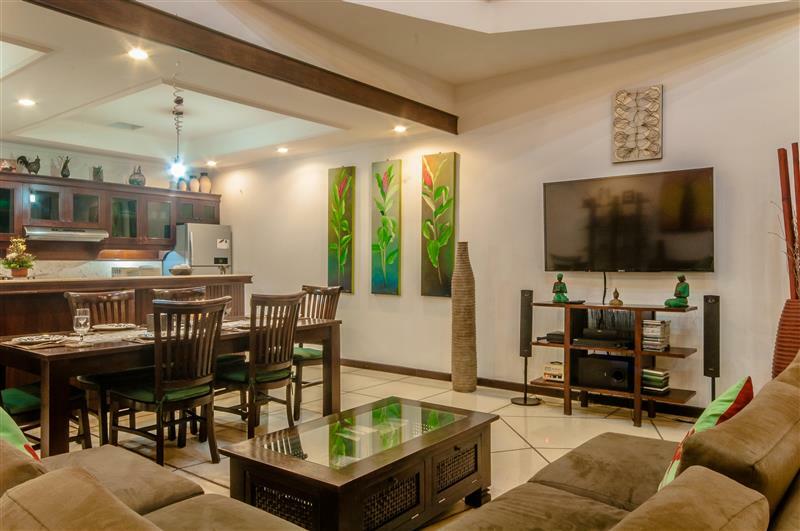 A large television, with comfortable cushioned sofas, is also situated in this space, as well as some board games and a small library of books and magazines for your entertainment. 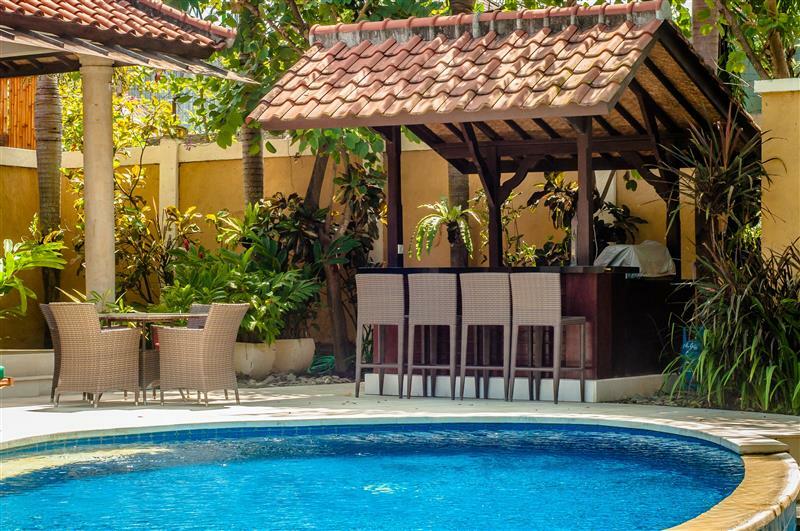 Additionally, there is a woven sofa and casual table and chairs which sit in the shade overlooking the pool and beautiful tropical plants. 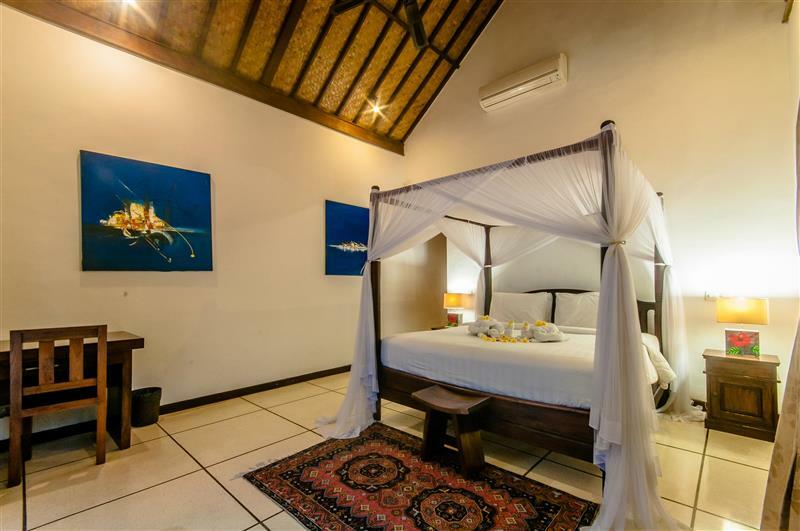 The villa has 3 king-sized bedrooms, all featuring grand four post beds with mosquito nets to aid a peaceful night’s sleep. 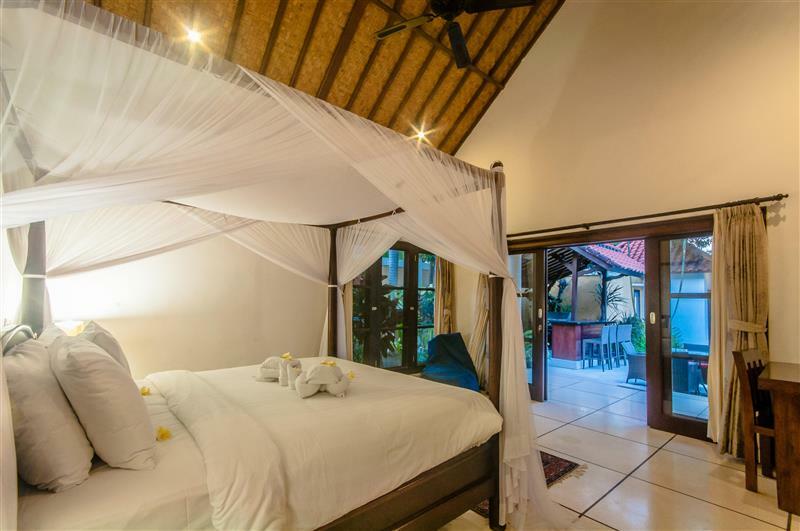 Two of the three bedrooms are co-joined with the main living space, while the third is in a large guesthouse in a shady corner of the garden. 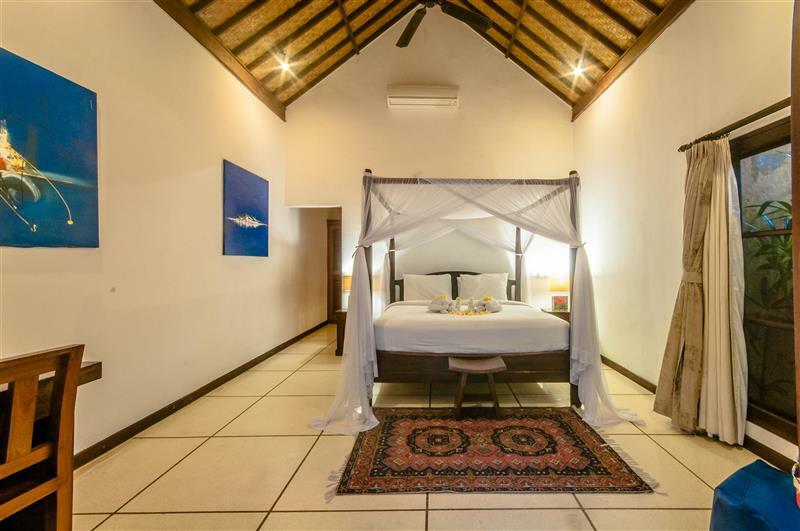 The two bedrooms attached to the main living space are both equipped with a desk and chair, air conditioner and ceilingfan, as well as a fully enclosed en-suite featuring a luxury bathtub and a door leading to your own private outdoor shower. One of the bedrooms features a television. 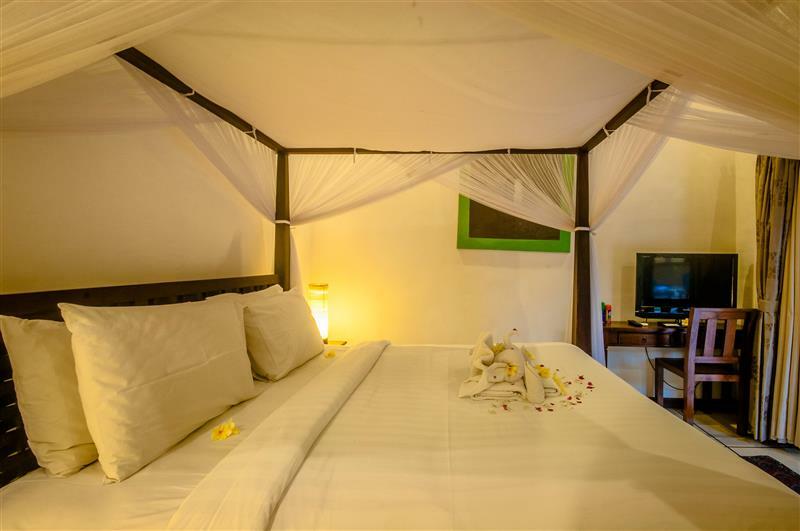 The third bedroom within the guesthouse also has a television, desk, air conditioner and ceiling fan, with an indoor shower as well as a door leading to your own private outdoor shower. There is also an expansive cushioned bay window. 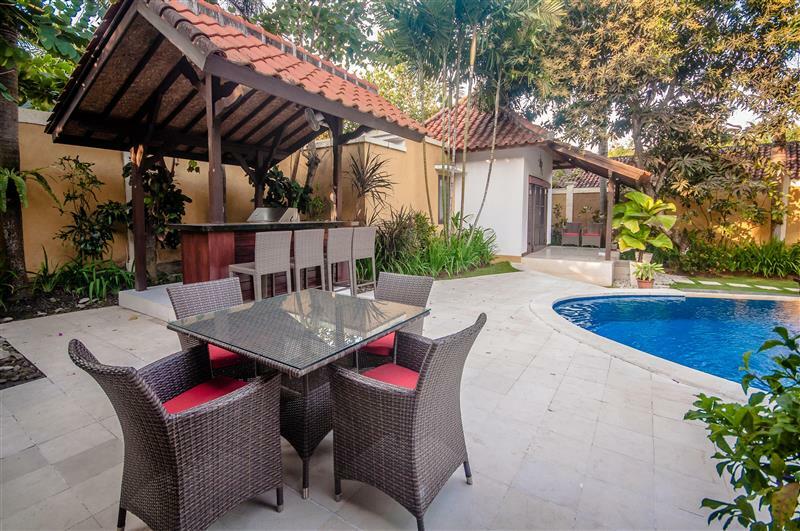 This guesthouse also boasts a shady terrace with seats, overlooking the beautiful tropical trees and plants around the pool. 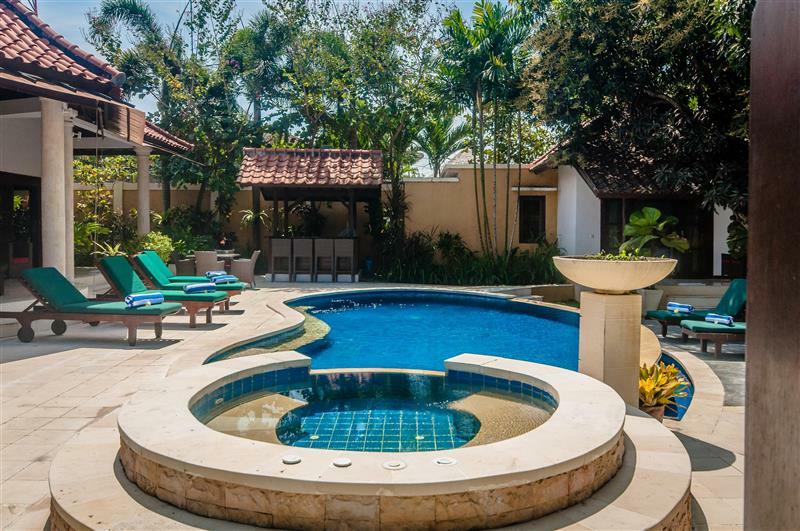 The garden in this villa is over two levels, meaning that the infinity pool has a beautiful running drop off at one side, creating a relaxing soundtrack of running water. 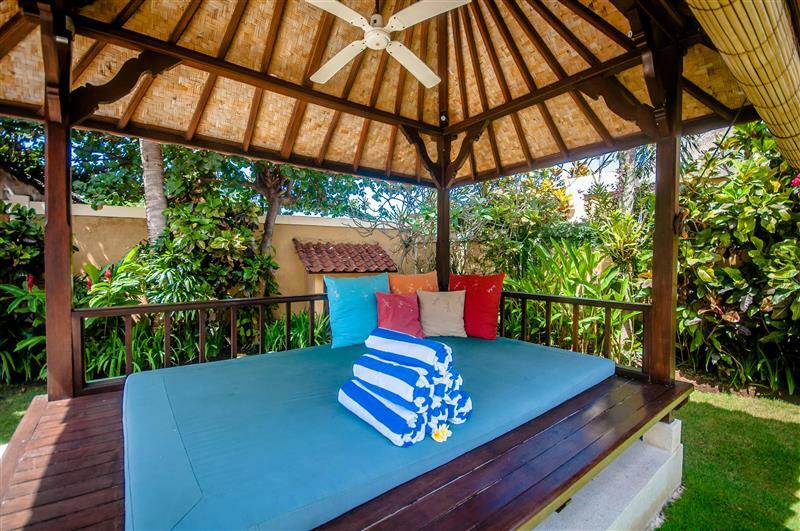 There is a large gazebo with a fan in which you can relax and enjoy a cold drink while enjoying your exotic surroundings. 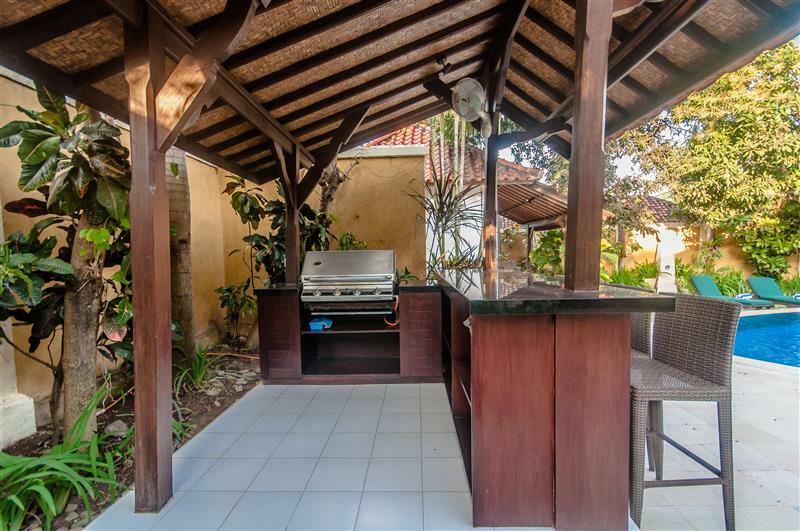 You also have a BBQ bar between the guesthouse and the main building, with surrounding stools, from which you can spend quality time hosting a meal with your family and friends. 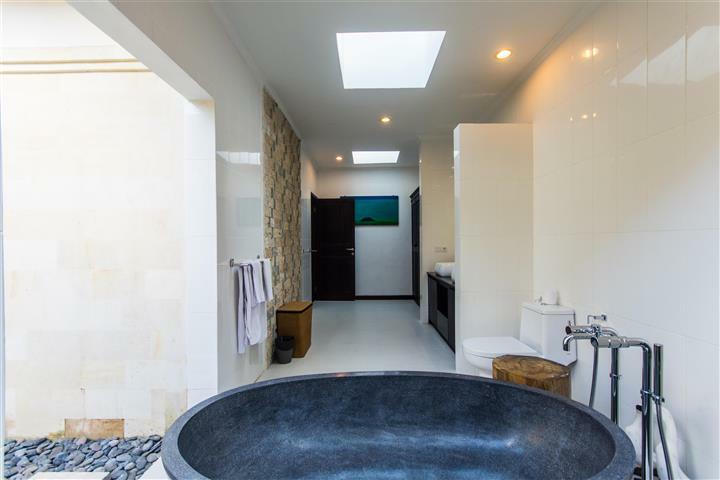 At one end of the peaceful pool is a cosy Jacuzzi bath, perfect for relaxing and de-stressing your body during your retreat here. We had 2 wonderful weeks at villa Ginger with our 2 teenage children. 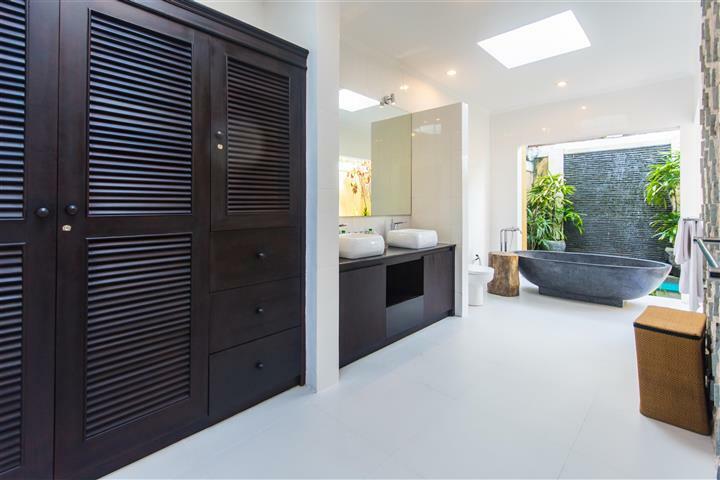 The villa was lush in every aspect and it was cleaned to perfection every day. The staff were wonderful and nothing was drama for them, especially when our son got an ear infection and Ana was lovely enough to take him to the doctors. We had an in house seafood barbecue which was Devine although it’s not really suitable for kids due to the spice and heat factor. 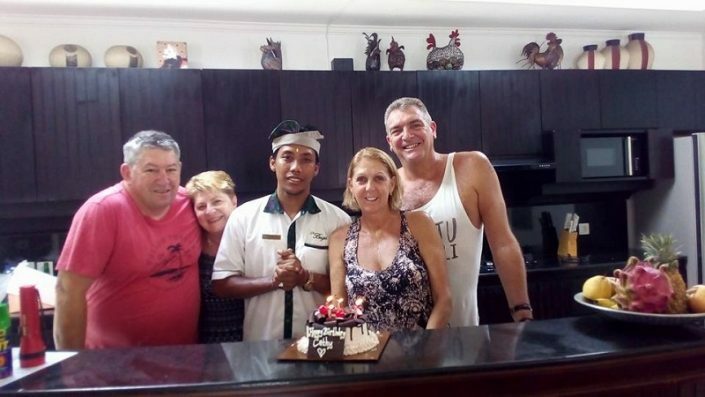 We couldn’t find anything to complain about, the staff went above and beyond every day to make our stay special and we would highly recommended it for your stay. 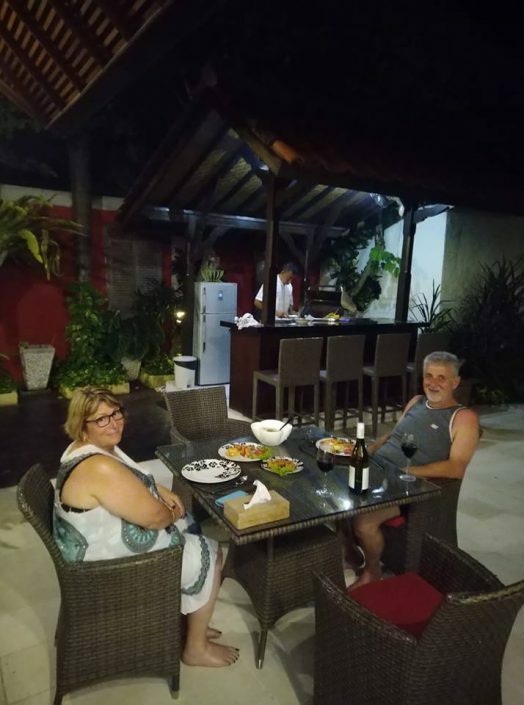 We had a great time in villa Ginger. 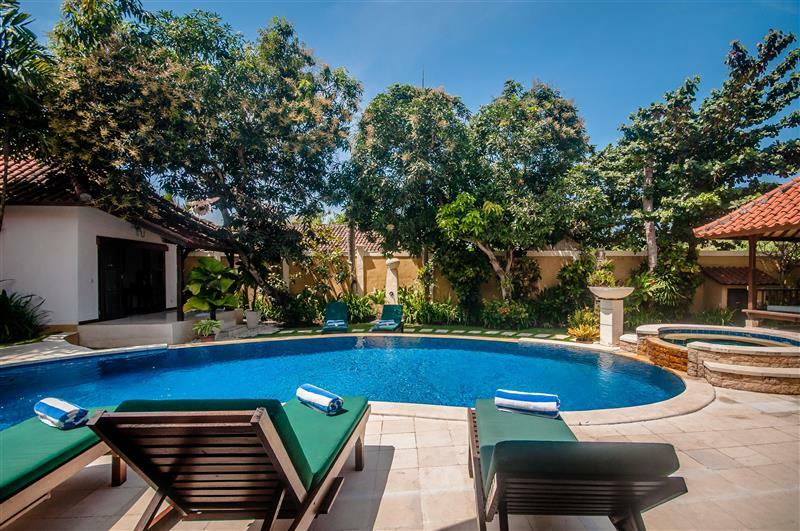 The villa is very well maintained, clean and has everything you need to enjoy a relaxed holiday with family. 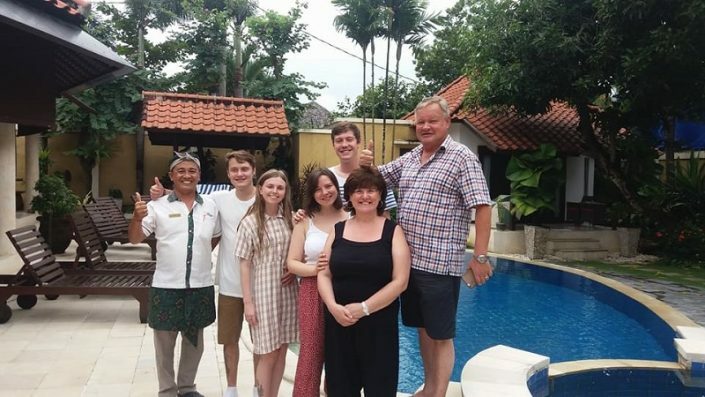 The staff are all very friendly and nothing is to much trouble for them, the breakfast cooked in the villa for you is excellent. I would highly recommend Bugs Villas and will be back again. 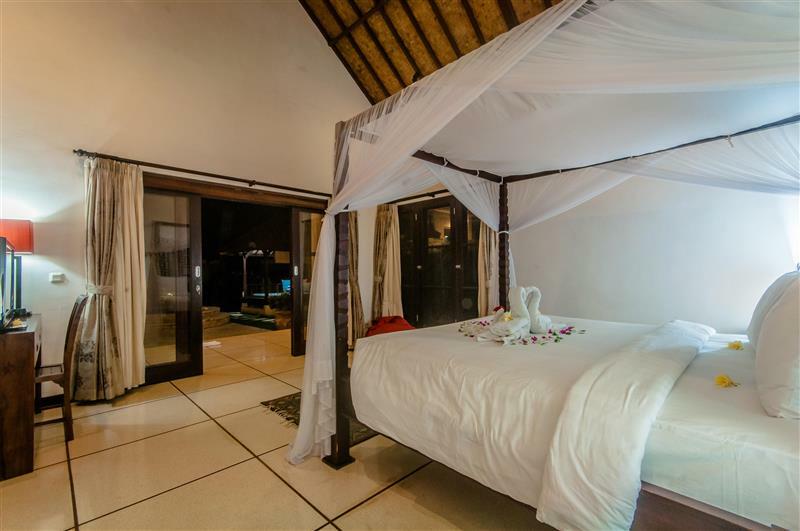 We stayed at Villa Ginger for a week in September and can’t recommend it enough. 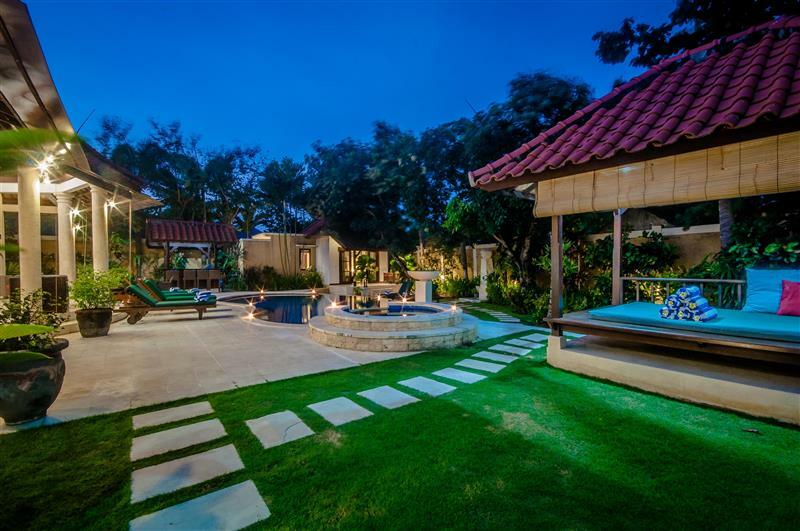 A superb villa, clean, great pool, close to beach, and eat street in Seminyak, and even though its close to the above places, its still nice and quiet, the ideal position in Seminyak. 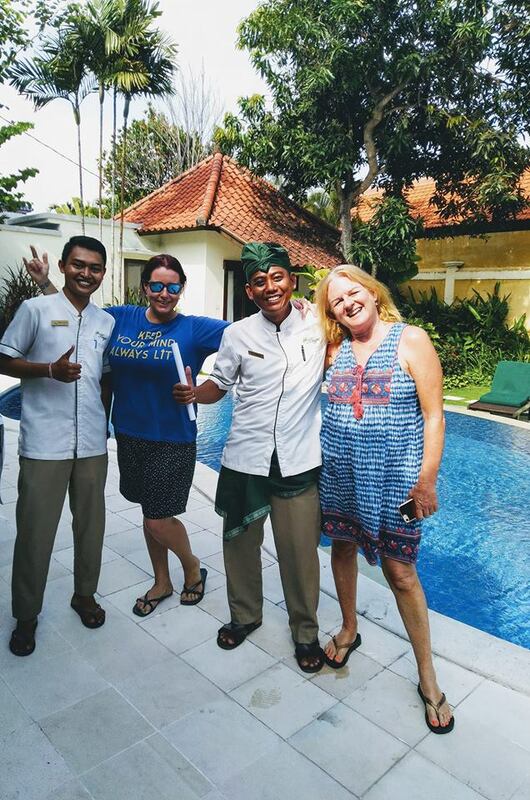 The staff that attend daily to clean, look after gardens and pool and cook breakfast are so friendly, and punctual, nothings ever a problem to them. We really enjoyed our stay here, and will return to this villa again. 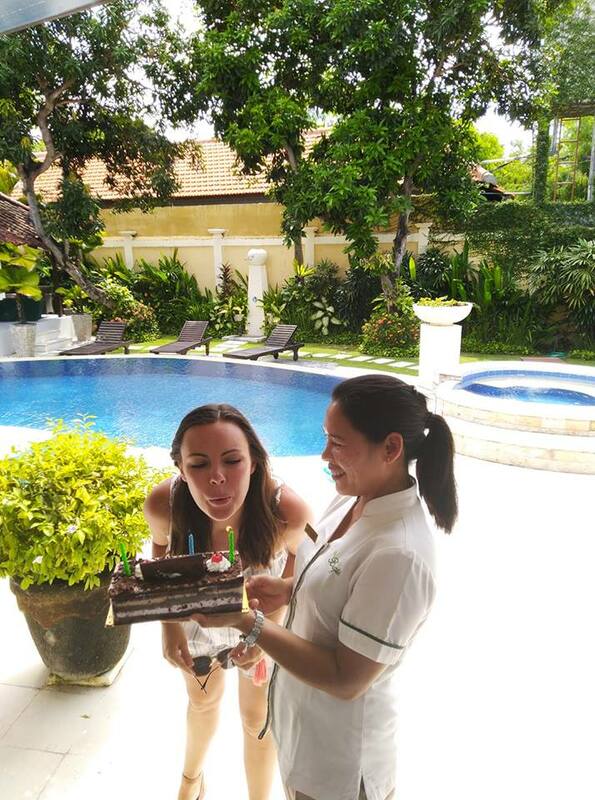 Love staying at Villa Bugis. 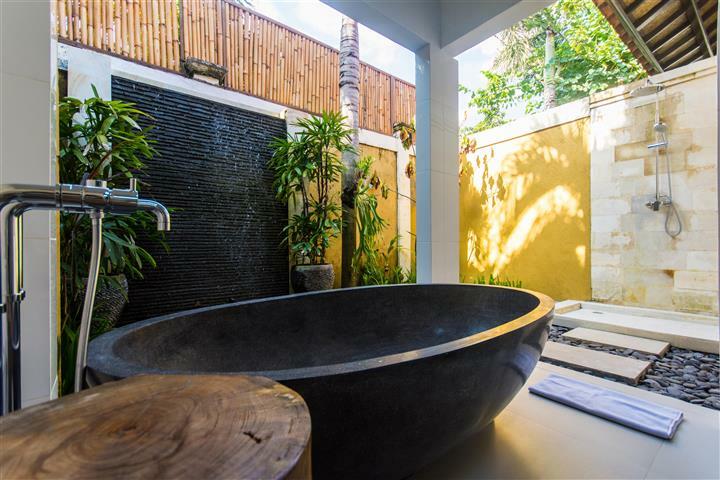 The villas are a perfect place to unwind and the staff and service is excellent. We are repeat visitors and will be going back again next year. 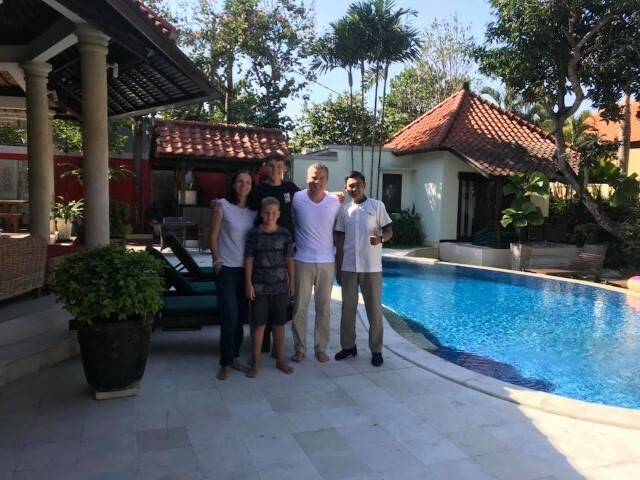 We stayed at the Villa Ginger for 10 days in September. Travelling was my Partner and I with another couple. We arrived in the afternoon to an amazing pool and spa greeting us as soon as we walked in. We then were introduced to the villa of 3 bedrooms and open plan living area. 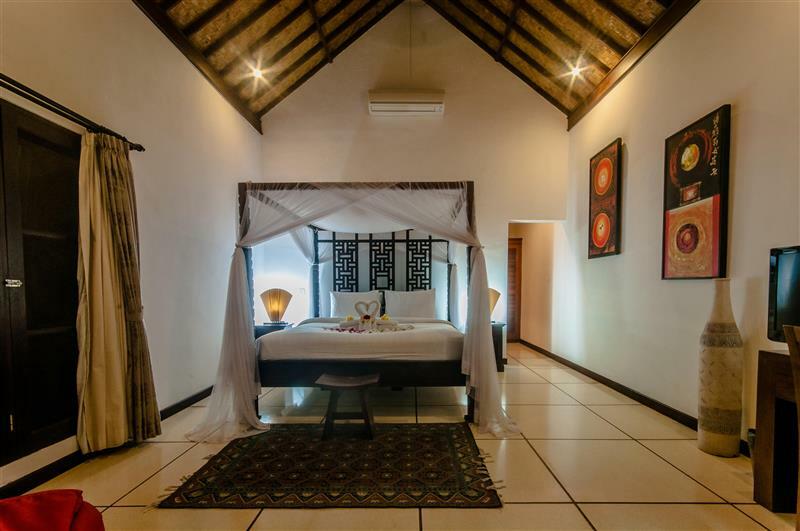 The bedrooms were very spacious with a large master bedroom with King bed with mosquito netting around the bed (very helpful at night to keep away the mozzies at bay) large outdoor shower and spacious bathroom and bath tub. Outside dominating the space was the excellent swimming pool and spa and lovely garden surrounding the area. The common area of dinning table with L shaped lounge enough sitting space for 6 and a large kitchenette area. Everything was as we expected from the photos we had seen except better. Morning breakfast made fresh daily from the choice of 3 menus. They even clean up after cooking then again after we eat. 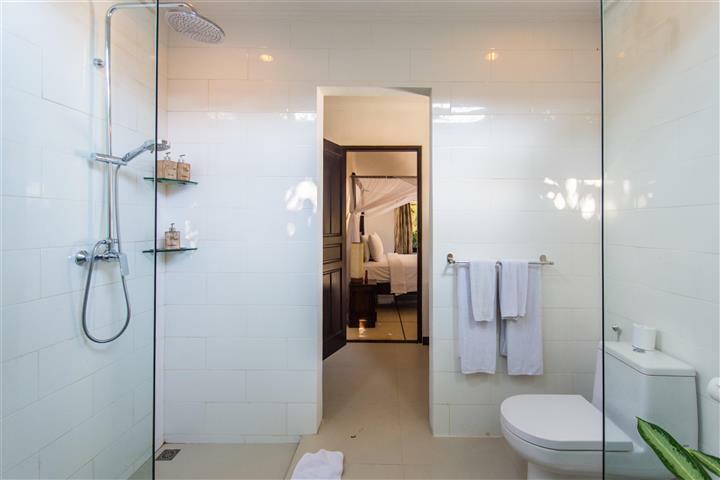 Rooms left very clean, towels replaced and rubbish removed daily. Gardener came in everyday to clean up the grass, any tree branches or leaves and clean things from the pool. Any problems we came across were fixed within minutes. Nightly mosquito coils were light to keep away the little buzzing creatures. Our daily visit from our “in-house”contact to check if anything was good and address any issues requiring attention. There seem to be a dog that lives next door who barks a little in the later afternoon and sometimes at night. Not really an issue from the villa and probably not much they can do to fix it. 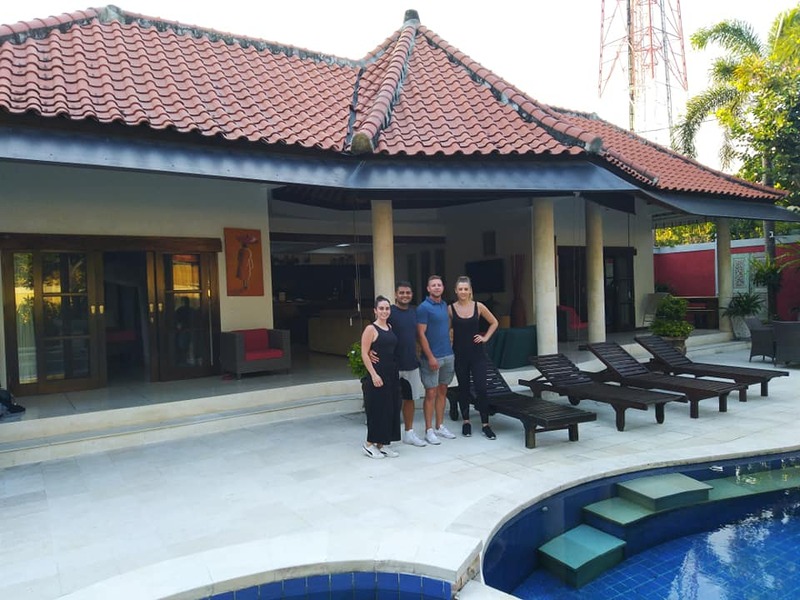 If you are thinking of staying in BALI then this is the place for you if you are 2 or 3 couples travelling together or a big family with 3 main bedrooms, all with their own privacy and space. The booking process for Villa Ginger went smoothly. The people I dealt with were genuine and delivered everything promised. The whole holiday was well organised. These people know how to provide a worry free holiday. The driver who picked us up from the airport remained on stand by If we needed transportation. 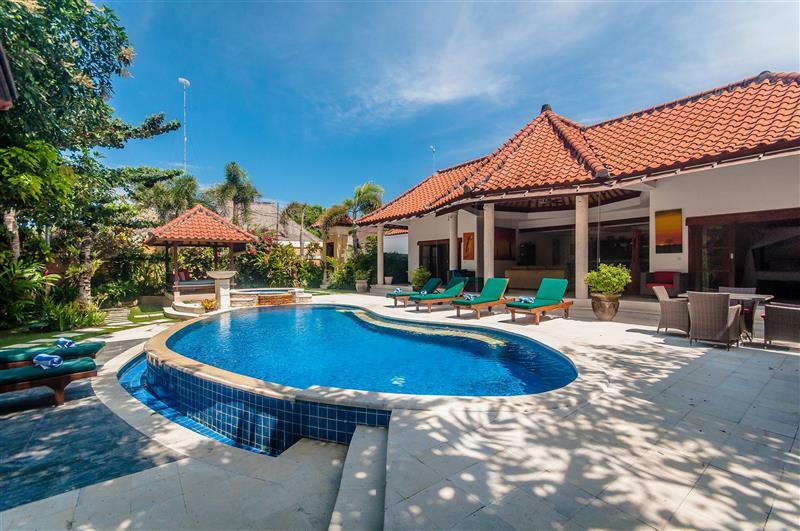 The villa was alway clean and provided a sacturary from the hustle of Bali. The location is great for everyone. For those who want the beach it’s an easy 7 minute stroll. And for retail therapy it’s about a 10 minute walk to Bintang shop which is the beginning of the best strip of shops in Bali. We often split up, my husband took the boys to the beach while my daughter and I went shopping. 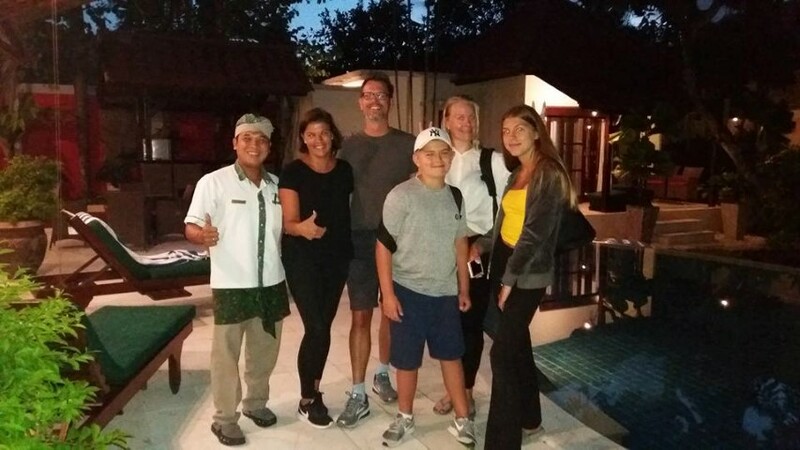 This is the second time we have stayed with his company, different villa, and can’t wait to come again. In fact I have booked to come back for a girls week! 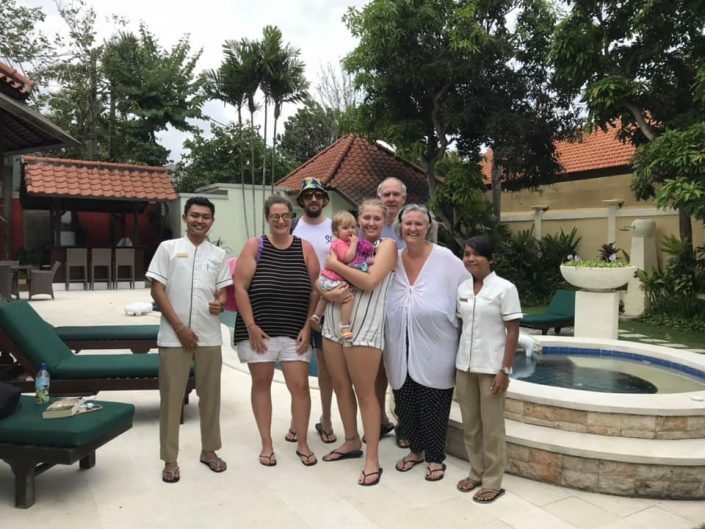 Thank you everybody at villa ginger, the security guards, the gardeners, the cleaners, the cooks, Rachel, Nyoman, and Peter Dysney! You made our holiday special. 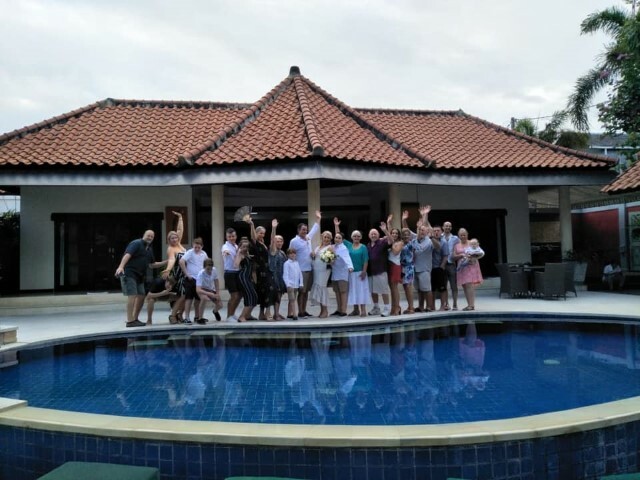 In January, we went to Bali to celebrate my mum’s 70th birthday. 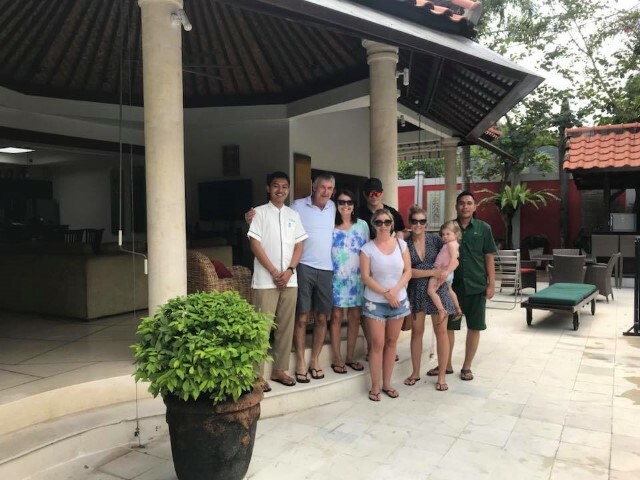 Villa Ginger suited our party of 4 adults and two kids down to T – with 3 standalone, double ensuite bedrooms, a swimming pool, and all the kitchen facilities that you could imagine. 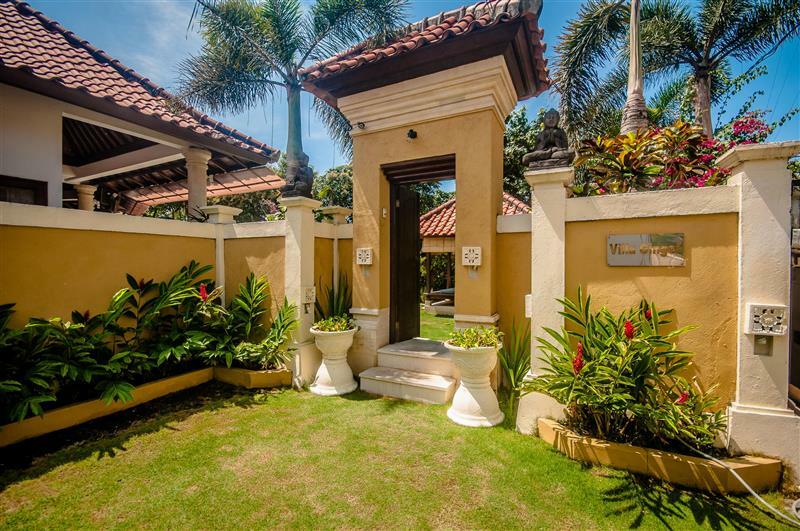 From the moment you open the door to the villa, you know that you’ve arrived at somewhere special. 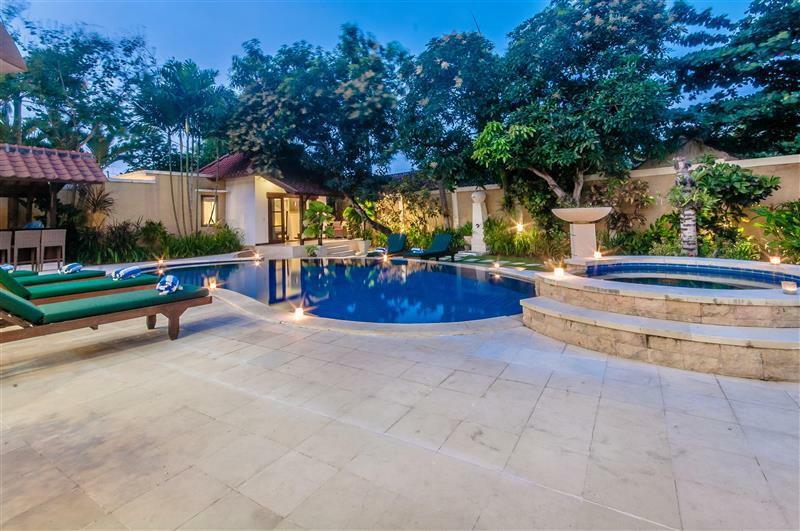 As well as the manicured garden and inviting pool, there is a separate outdoor barbeque/bar area, plus an open lounge with a flat screen TV, DVD and stereo. 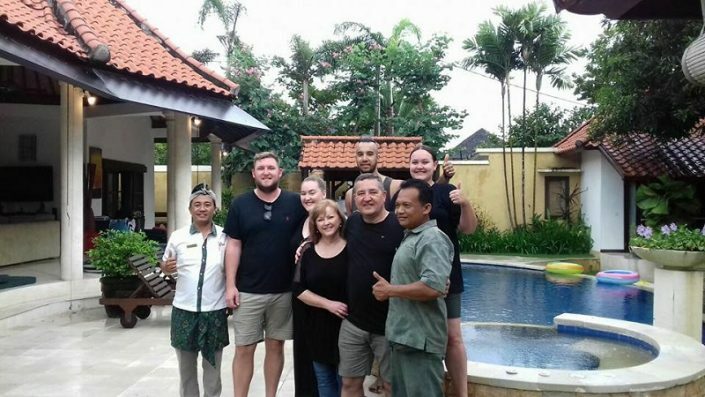 The attentive staff, who would arrive every morning and evening to clean and turn down the rooms, could not do enough for us – arranging lifts, recommending places, and even offering to cook. For those who like to dabble in the kitchen, there’s everything you need to rustle up a feast. 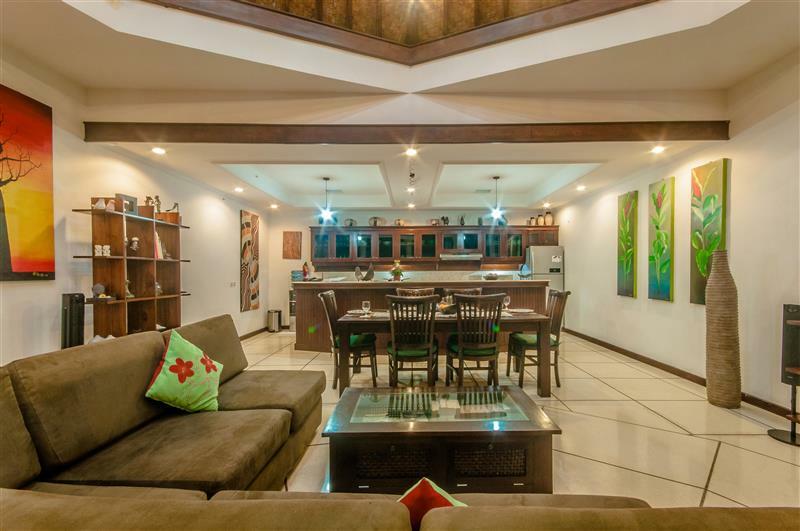 There’s also a spacious living area for you to kickback and read a book or watch one of the many DVDs. 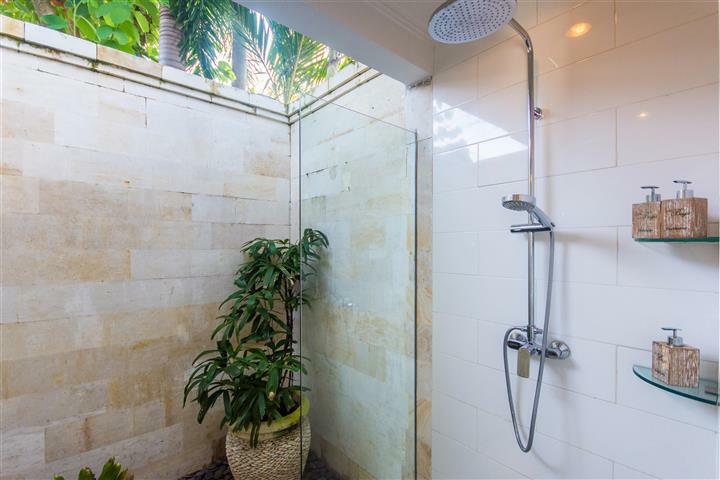 Villa Ginger is nicely situated with the main high street in Seminyak only a short walk away, while great places to eat/drink (eg Kudeta and Potatohead) are a little hop by taxi away. 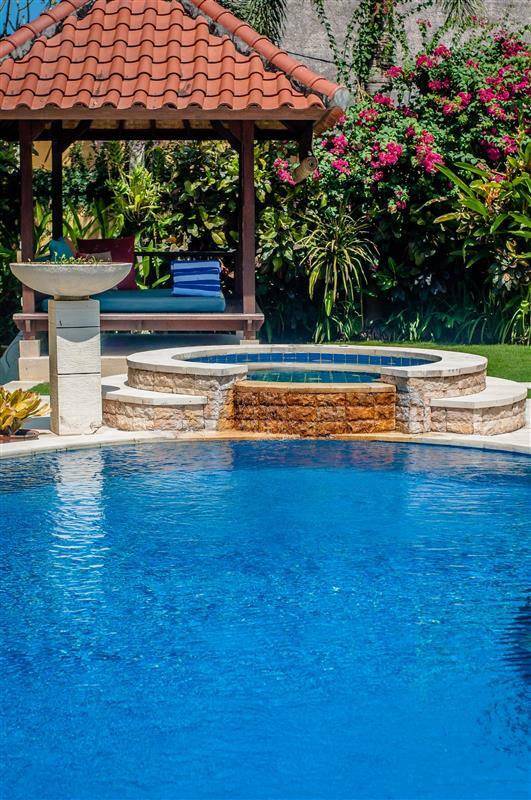 We don’t normally return to the same holiday places, but Villa Ginger was so relaxing that we’ll be back! 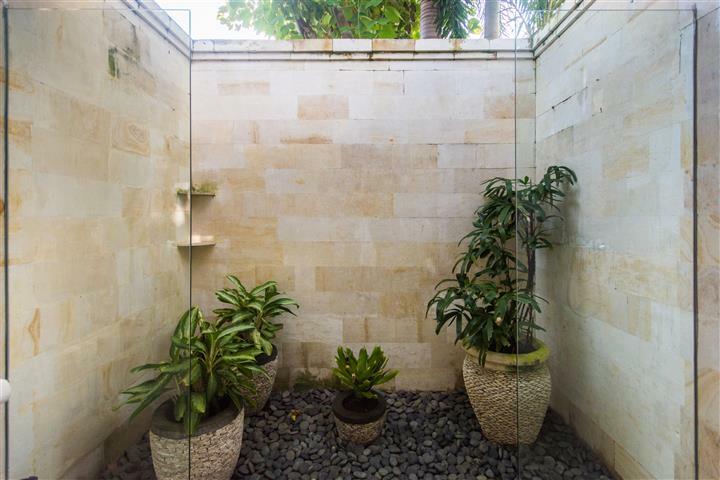 ps A word to the wise: To avoid Bali Belly, be sure to stick to the bottled water! 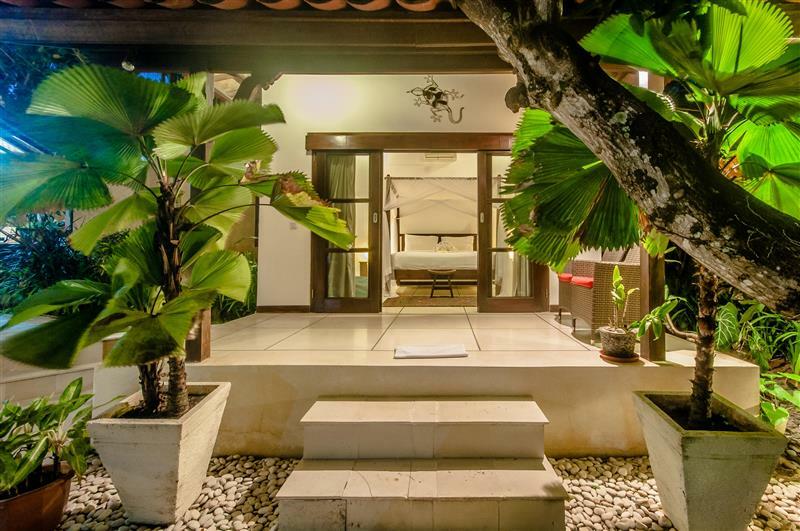 Villa Ginger is a fantastic little oasis tucked away in Seminyak with everything you could possibly want to bunker down and not move an inch. 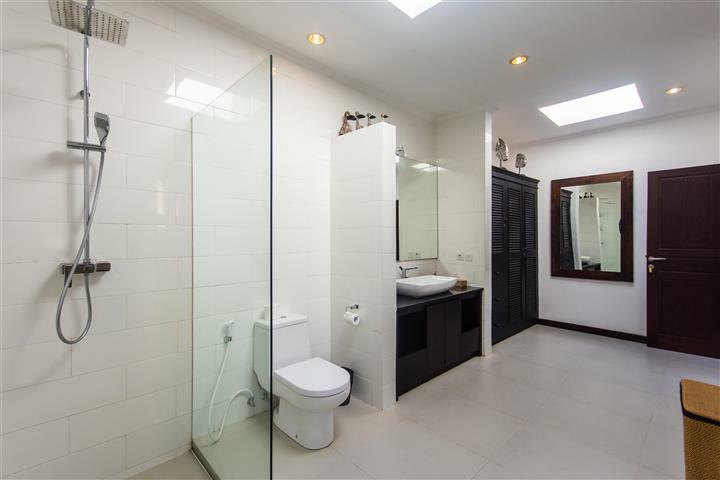 No need to venture out at all, but if you want to, the beach, shops, beauty salons and all manner of cafes and restaurants are within walking distance, or at worst, a short cab ride. 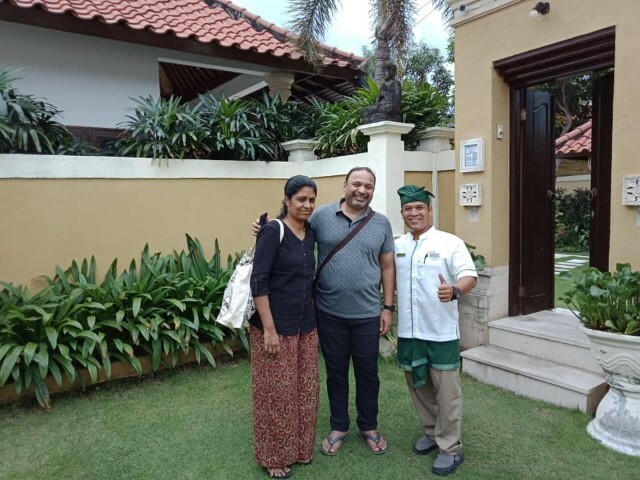 We organised a driver through the complex, on two separate days to tour and explore temples, rice fields and villages. Highly recommended. 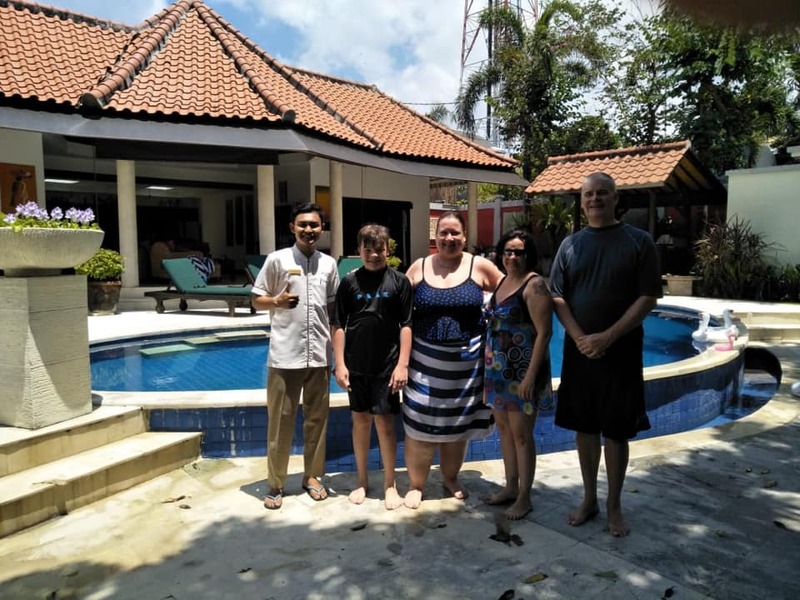 we have stayed at several of the villa bugis villas and always had an enjoyable stay. 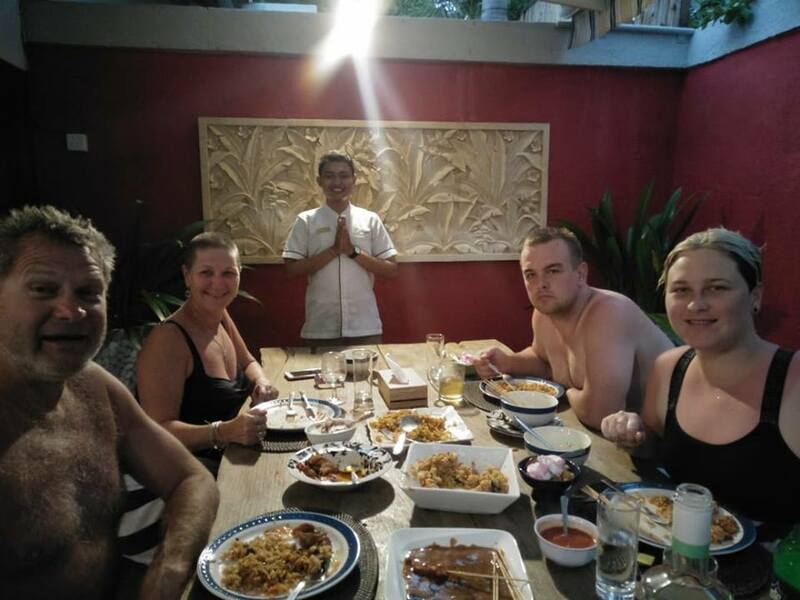 5 of us stated at villa ginger on this occasion and we all agreed it was the best time ever. 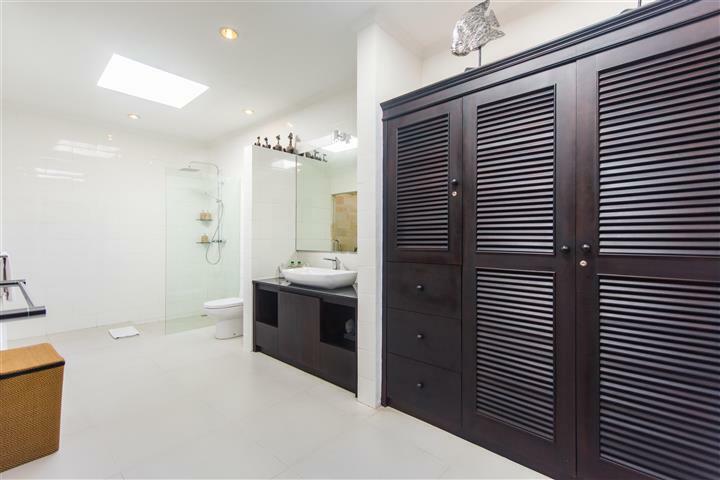 centrally located to all conveniences and the beach we will definitely be retuning. 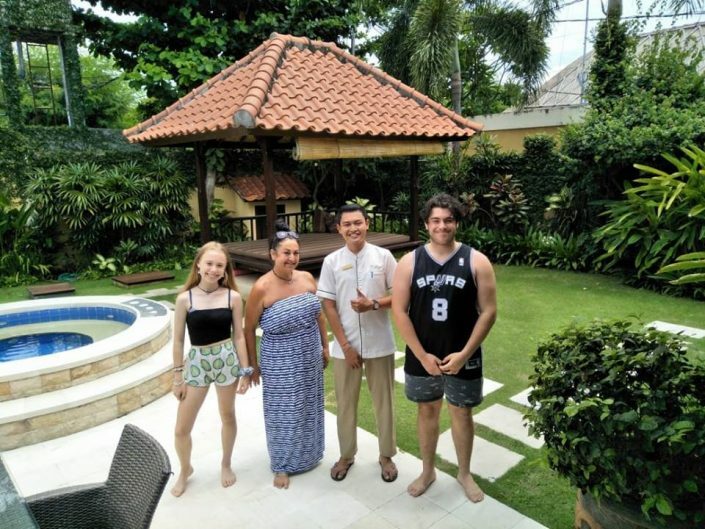 great staff great villa great time. The staff are extremely friendly and very helpful. 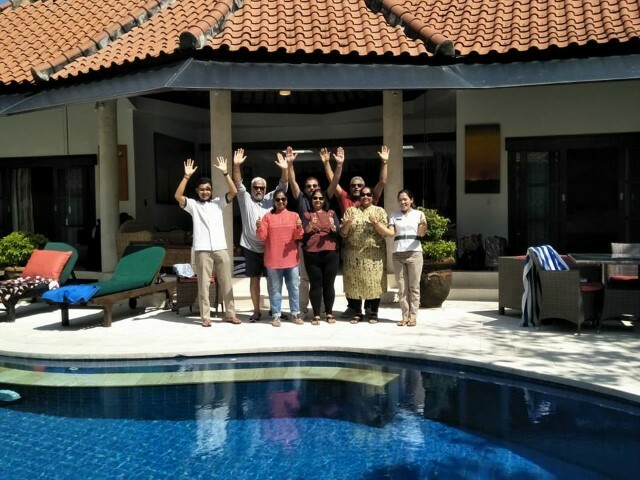 The villa was beautiful and well equipped with everything you need to keep your stay relaxed and fun. 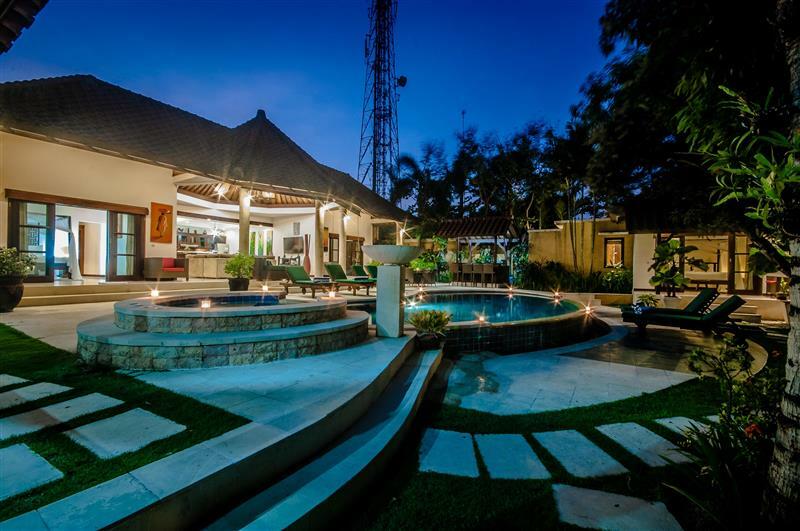 I would highly recommend villa bugis.